The incident of a surprising and unexpected catch in the lake of Galilee has been redacted by the Gospel-writer. Luke did so to instill spirit into the Church when it experiences that all its efforts to communicate their message are failing. What we’re told is very clear: we need to put our hope in the power and the attractiveness of the Gospel. The story begins with an unusual scene. Jesus is standing on the banks of the lake, and the people are pushing all around him to hear God’s Word. They don’t come motivated by curiosity. They don’t draw near to see prodigies. They only want to hear God’s Word from Jesus. It’s not a Sabbath. They aren’t congregated in the nearby synagogue of Capernaum to hear the readings that are read to the people throughout the year. They haven’t gone up to Jerusalem to listen to the priests of the Temple. What attracts them so much is the Gospel of the Prophet Jesus, rejected by the neighbors of Nazareth. In addition, the scene of the catch is unusual. Night is the best time to fish, and Peter and his companions did so but don’t have anything to show for it. 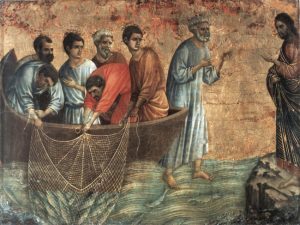 Now it’s daytime and they cast their nets trusting only in the word of Jesus who’s guiding their work: they get an abundant catch against all their expectations. At the bottom of the data that day by day clearly shows the crisis of Christianity in our midst, there’s an undeniable fact: the Church is unstoppably losing the power of attraction and credibility that she had just a few years ago. We mustn’t deceive ourselves. We Christians are experiencing that our capability to transmit the faith to the next generations is getting less and less each day. There’s no lack of efforts and initiatives. But seemingly it’s not only or primarily about inventing new strategies. The moment has come to remember that in Jesus’ Gospel there’s a power of attraction that isn’t about us. This is the most decisive question: Do we keep «doing things» from the perspective of a Church that’s losing attractiveness and credibility, or do we put all our energies into recovering the Gospel as the only power capable of engendering faith in the men and women of today? Don’t we need to put the Gospel in the first place above all? What’s most important in these critical moments aren’t the doctrines elaborated throughout the centuries, but rather the life and person of Jesus. What’s decisive isn’t that people come to take part in what we’re doing, but rather that they can enter into contact with him. Christian faith only wakes up when people meet witnesses who irradiate the fire of Jesus.